Here a method is shown which supports particle oscillation. The concept may be extended to other particles as well. At the top is an anti-strange and bottom quark. 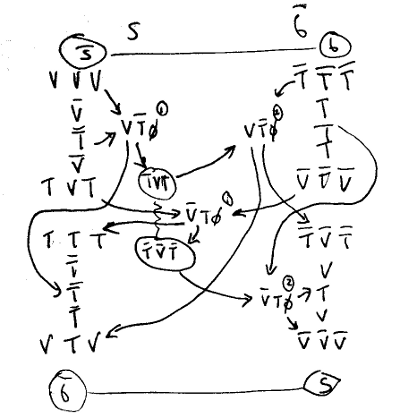 Through the intermediary of a gluon (pion-0 up type) and two pairs of matched VT0 phase transforms the two quarks spontaneously transform into anti-bottom and strange. As there is nothing to prevent the reverse transformation taking place they oscillate continuously. It is duly noted that gluons are considered in the Standard Model to be the "force" that keeps particles intact. When it is considered that gluons are virtual pions, and that virtual pions (as standing wave patterns themselves) can represent a phase differential between two other standing wave patterns (i.e. particles), the perspective of the gluon as "force carrier" in the Standard Model begins to make more sense. In the context of B Meson and other oscillations, therefore, we make the observation that the "gluons" needed to keep the quarks together become of sufficient magnitude (or the instability within the structure becomes of sufficient magnitude) such that the simplest way to resolve the instability is for these phase transforms to take place.